3. Eating healthy, nutrient dense food - with a good mix of protein and carbs. Today's lunch! 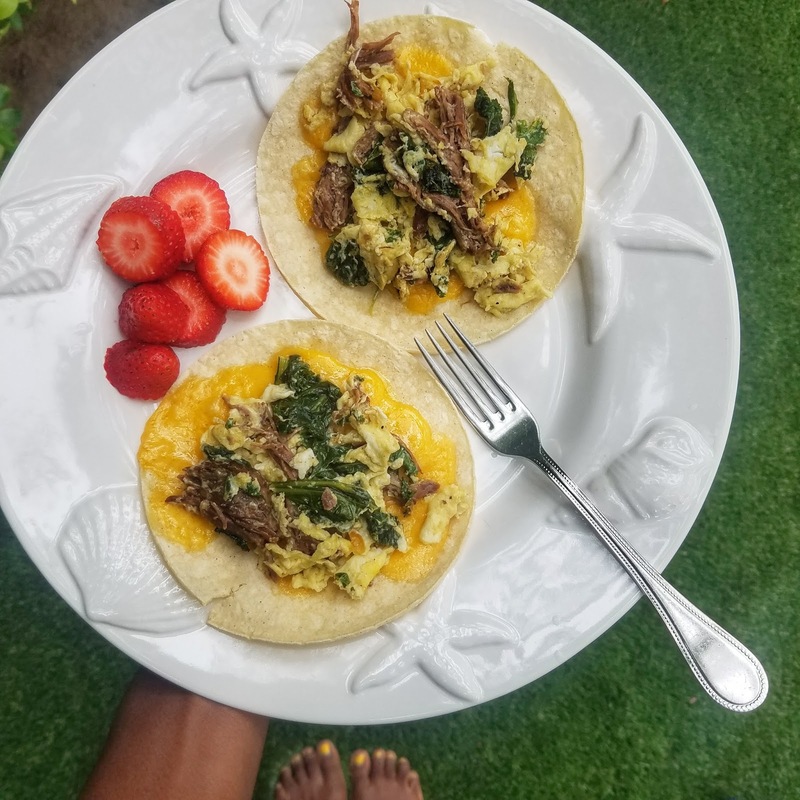 Kale, steak, eggs cheddar cheese tacos. You can read more about my love for food during training HERE. 6. Strength training (a few times a week - critical to keeping your body strong and preventing injury - this includes CORE and GLUTE work). 17. Tart cherry juice is great to combat inflammation. Also, ginger and turmeric. I always have a bottle of tart cherry juice in my fridge. 18. If you have PT exercises - performing those during the week. If you haven't been to a physical therapist, it's a great idea to consult with one. The therapist can give you exercises based on your weaknesses that will help to prevent injury. 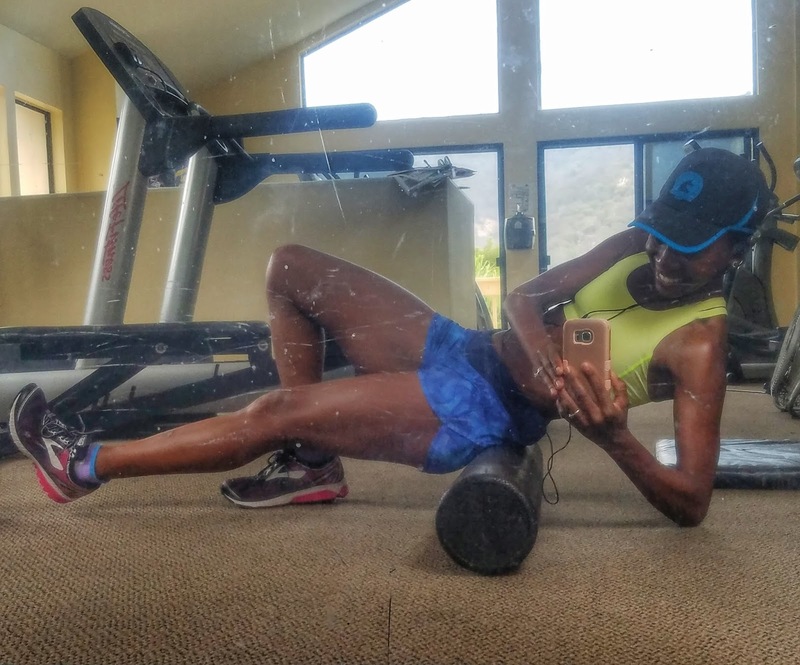 Foam rolling hurts so good. I went on a beach walk with my sweet friend Joanna yesterday. 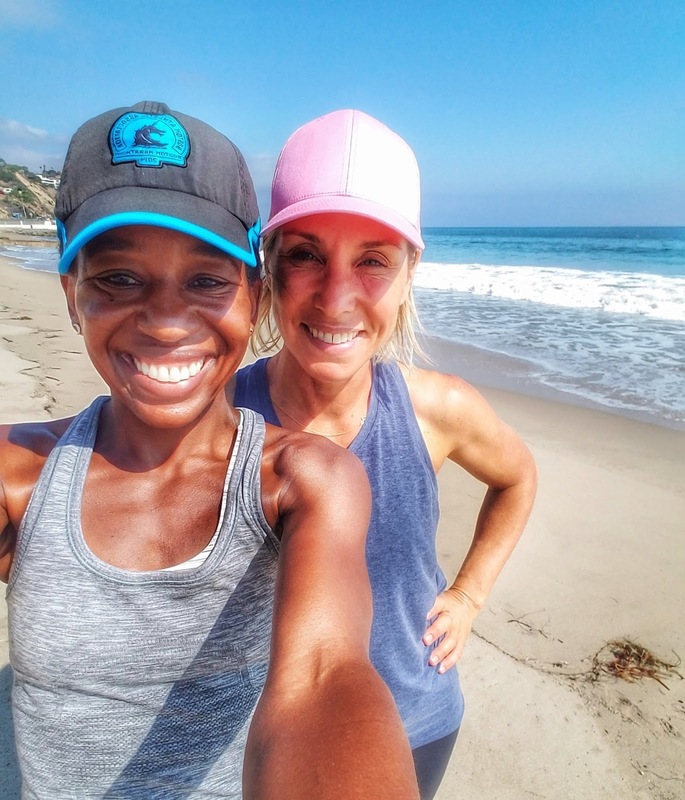 I ran an easy four miles, she went to Cross Fit and then we met up at the beach. I love connecting with women that inspire me. Joanna has FIVE kids, yes five. She is beautiful inside and out, an amazing cook, dynamic public speaker and she makes it all look so easy. We talked about that NO, it's not easy, but you set priorities and enjoy the ride. Joanna asked me about what do I to keep my body healthy and ready to run - when I listed a few of the things, her response was "Whoa. That's a lot." Yes, it is, but as runners we love it and if you love it then it doesn't seem like work. Tuesday September 12th - 7 miles. I had a great night's sleep and felt ready to tear up the road on this run. Alas, it was an easy run - so kept it nice and easy (8:56 pace). Nothing to prove on these runs, get the miles in and rest the body. Wednesday September 13th - 10.25 miles. 2 mile w/up, 5 x 1 mile repeats: 6:27, 6:22, 6:23, 6:19, 6:16 (.25 jog after each set), 2 mile cool down. I did these repeats on flat, boardwalk at the beach. I get in plenty of hills during the week and I just wanted to focus on speed today. Really happy with this workout. Seeing some strength on these and a great confidence booster. Boom! Still plenty of time to improve. Friday September 15th - 10.3 miles which included 8 x :30 second pick ups. All of the pick up paces were between 5:40-5:55 except two in the beginning which were 6:30/6:40 range. An improvement from last week when there were only two pick ups in the 5 something range. September 16th - 7 miles. September 17th - 14 mile "shorter" long run. First four miles easy at 7:55 pace, then six miles at 6:59 pace, last four miles at 7:40 pace. This workout was done on the treadmill. We had so much going on for Sunday and I opted to sleep in a little bit before church. Then off to church, followed by back to school picnic (a big deal at our school and so much fun! ), then off to visit my family friends and visit with them after a tough week of loss. Sooo, then only time was on the treadmill, and I'm okay with that. Family first always and at the end of the day I did the work with a good effort.